Do you ever feel like you've given your best effort, done everything required of you, but still you're not as well liked or accepted as other people? Your best just isn't good enough? This week, Baylor and TCU feel the pain of being the bridesmaid and never the bride. Both football teams lost only one game all season. A total of five teams shared a one loss record, but since Florida State was undefeated, only three of them could make the inaugural college football Playoffs. 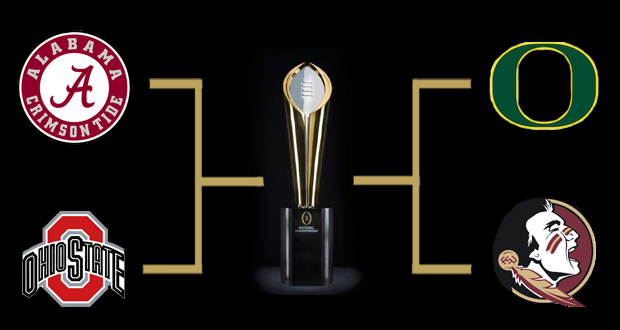 The Playoff Selection Committee, for a variety of reasons, deemed Alabama, Oregon, and Ohio State more worthy of a place in the playoffs than either Baylor or TCU. Was it the fault of Baylor or TCU that the Big12 doesn't have a conference championship game? No. Did Baylor or TCU know how important non-conference schedules would be when they planned their 2014 schedule over a year ago? No. Could Baylor or TCU impact perceptions of the other three teams since they didn't play them? No. Each team did the best they could and even though they had the same number of losses they are left outside looking in. Christianity is much like this. We live our lives to the best of our ability. We treat people well. We're as good as we can be. But all our efforts still leave us on the outside of eternity looking in. We're measured against an impossibly high standard that our best efforts just can't meet. Perhaps we feel that it's not our fault. And that's where grace kicks in. "God demonstrates his own love for us in this: While we were still sinners, Christ died for us." (Romans 5:8) We were on the outside looking in, but God sacrificed his perfect Son to open the door and grant us entry to his eternal kingdom. How ridiculous is this act on God's part? Can you imagine the perfect (13-0) Florida State suddenly saying, "We'll forfeit our spot in the playoffs so that Baylor and TCU can play." (I know the math doesn't work.) The FSU fans would go crazy!! Every administrator at the university would be fired. The internet would probably blow up. Yet as Christians we talk about God's grace to us as though it's the most natural thing in the world.